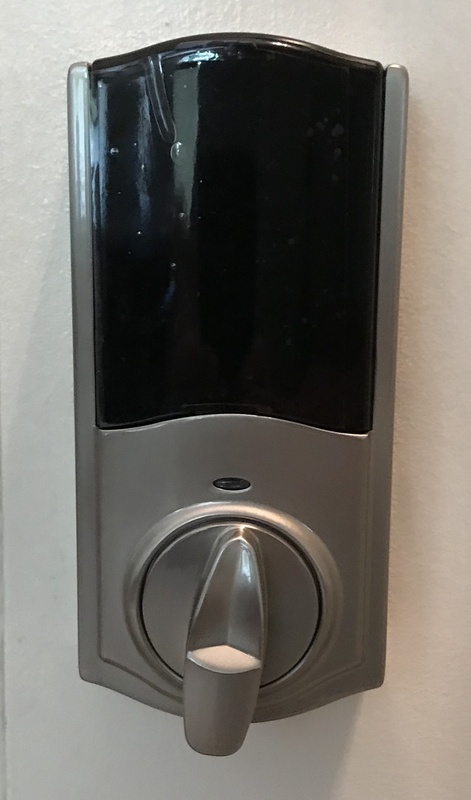 We have been using Kevo Touch-to-Open Smart Locks, together with the Kevo Plus, for several years now and have been generally pleased with the performance. Kevo contacted us recently to see if we would be interested in writing a Kevo Convert review, but it won’t work for us since we already have smart locks on all our exterior doors. We reached out to our friend and AppMyHome follower Laura Hollis to install it and share her review. It is also posted on her blog, gottobeme.com. Affiliate disclosure: This page contains links that may earn us a commission from Amazon Services LLC Associates Program. We received the Kevo Convert as a part of this review. Opinions and conclusions are our own. In early July 2018, I decided to put my toe further in to the ‘Smart Home’ water. I determined my next step was to install a ‘Smart Lock’. The Kévo™ brand made sense for me to try, as their site claimed their Convert Smart Lock Conversion Kit would work with my existing Baldwin deadbolt. During the unboxing, I saw there were three ‘kits’ that could be used for the install. It wasn’t obvious which one I needed at that time, so I pulled them all out and set them aside in their individual packages. After laying out the rest of the contents, I followed the ‘Quick Setup Guide’ that was also included. As instructed, I downloaded the Kevo application, opened it, created an account, confirmed I received their email to the address used in the application, then I was on my way to device installation and setup. This is where things started to get tricky. Using the application on my phone, I confirmed I had the suggested tools in front of me and my deadbolt and door dimensions were listed as ‘compatible’. The guide then began walking me through installing a brand new deadbolt, which I didn’t need, so I skipped those sections. The next part caused me to take to the internet for further instruction. The guide in the application was showing me how to install a latch that contained cables which needed to be routed through the holes in the deadbolt lock. Since this wasn’t the correct scenario in my case, I went online to see if I could find a guide for this particular model. I found Kevo’s DIY Installation video here and it walked me through the entire process quite nicely. The interactive guide on the same page was helpful as well. A word of warning – if you are like me, you may need to force yourself to stay with the guide while watching the video. Try not get ahead of her because you ‘think’ you know what comes next. I extended the installation time by quite a bit because I thought I knew where she was going. I jumped ahead, found out it wasn’t working as it should and realized I’d obviously missed some key points or didn’t listen well enough. I had to reverse the steps I’d taken and figure out where’d I’d gone awry, then start again from that point – after also putting the video back to the same point. Sadly, this happened more than once. When the steps are followed correctly, installation time could be as little as ten minutes. The video instruction was clear and installation was simple and easy. Before adding the interior cover, you’ll need to pair the lock with your smart device of choice. I wanted to include that sentence here because I may have ‘skipped’ the pairing step as I happily secured the cover to the interior assembly, then tried to pair the unit. (Hint: it doesn’t work that way.) After removing the cover again, however, it was easy to follow the instructions inside the Kevo application and ‘set up a lock’. I followed the instructions and tested the unit’s orientation prior to pairing and adding the interior cover (again). The testing resulted in a green LED success light. However,once the door was closed and I tried to engage and disengage the bolt using the application on my smart phone, I received an error message stating there was a ‘Bolt Jam’. The bolt would still engage, but the Kevo application got confused and didn’t know if the door was locked or unlocked anymore. This isn’t helpful. I emailed Kevo support regarding the ‘Bolt Jam’ error and the connection issues I was having. I did this using the ‘Send a Question’ option on their support page. I didn’t receive a ‘request received’ automated response from the site, nor have I been contacted by anyone from online support since. Email is my preferred form of communication and I wasn’t sure when I would have time to get back in front of the unit for phone support and troubleshooting. James the Cat at least tried to help. But he quickly became more interested in the discarded packaging. It has now been weeks with no contact from Kevo Support, even when attempting to communicate through a third party in marketing. I can admit that, perhaps, I could have typed my email address incorrectly when submitting my initial support request via their website, but I know this is not the case when my emails were forwarded to support later. I’ve found the lack of communication from the support team disappointing. In one final attempt to fix the issue with the deadbolt having difficulty during the ‘engage’ process, I dismantled the unit again. I had tried both of the mounting plates that were said to be used for different Baldwin deadbolts (Kits B and C) and just wasn’t sure what else I could try. During the process above and in my desperation to get it to work, something occurred to me. When I moved into the house, I switched out all of the hardware. I put the Baldwin hardware on all of my exterior doors. However, I did NOT switch out the deadbolt mechanisms – just the striker plates and exterior components. Since the deadbolts were already working, I didn’t want to jeopardize their alignment unless I needed to. What that means is the actual deadbolt I am using with Kevo Convert is NOT manufactured by Baldwin. I went back to the drawing board and used the one mounting plate I hadn’t tried – because it wasn’t for Baldwin – and once installed, the deadbolt engaged and disengaged smoothly when the inside assembly and outer cover were put on again. Heck, even the screws securing the inside assembly and outer cover went in easily and flush, unlike my previous attempts. First and foremost, do not be a ‘me’. Confirm the brand of your deadbolt mechanism and not just the exterior components that operate it. That, and following the instructions carefully (as noted above), will get the Kevo Convert installed and working properly in minutes! That being said, after putting this in place, thinking it would be a great beginning to a smarter home, I’m not sure I’m sold on the idea. If you have to be within 100 feet of your door for this unit to function properly, you may as well have a physical key in hand and simply walk up to it, unlock it and gain entry the old-fashioned way. I know this might be better used to hand out ‘electronic’ keys (eKeys) to those who might need entry to your home, but I’ve never come across a time where this would be necessary. However, I HAVE come across a time when I was away unexpectedly and wished I had given a spare key to someone so they could stop by to check on things. Those are the times I wish I could unlock the house for someone when they show up, and those are the times I am much further than 100 feet away from the lock. In those cases, in order to use an eKey, the user must have either a Wi-Fi or a cellular connection on their device. Yes, as difficult as it is to believe, there are still people who have not stepped in to the smart phone age. There are also those who may have a smart phone, but aren’t really savvy in how to utilize all of its functions and applications. They just need it to call people. Often those are the people I might need to let in to the house. Kevo has an additional product, the Kevo Plus, which allows you to unlock and lock the door from anywhere in the world, but that requires a separate $99 investment. I think the Kevo Plus may also help with any connection issues and, to me, would make this smart lock smarter and turn it into an all-around winner for me. If I decide to go that route, I’ll be posting a review of my new Kevo Plus and how it integrates with everything in the home and on the smart devices. With all of this in mind, if issuing eKeys or accessing your lock within a limited distance with a smart device works for you, or if you have an existing deadbolt and you’d simply like to swap its controls out for something more dramatic that can be operated via Bluetooth, the Kevo Convert should be a great addition to your home. It is very stylish, functional and easy to assemble and install.